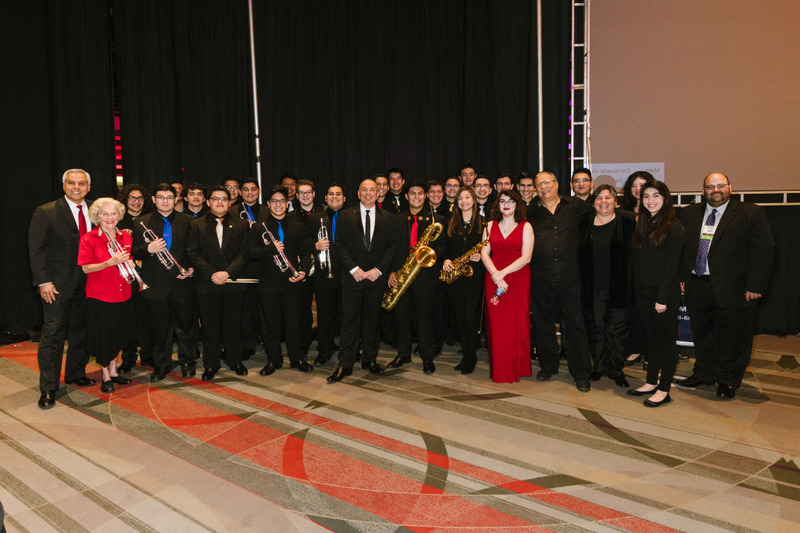 The Harlingen High School Jazz Ensemble from Harlingen, Texas put on a special honor performance at the Texas Music Educators Association conference in San Antonio on Friday, February 10. The jazz ensemble was joined on stage, at the Henry B. Gonzalez Convention Center, by 10-time Grammy award-winning musician Arturo Sandoval-trumpet. Harlingen High School was selected for the performance through a rigorous audition process in which high school jazz bands throughout Texas submitted an audio recording of their groups. A panel of judges critiqued recordings with the winning group being selected as the TMEA High School Invited Jazz Band. The jazz ensemble presented an hour concert at TMEA in the ‘Stars at Night Ballroom’ during the first half of the day. The group also presented a session for the TMEA membership called “A Smash Course on the Ins and Outs and the How-Tos of Big Band.” Former Maynard Ferguson musician Denis DiBlasio led the session later that same evening. Most recently, Harlingen High School is one of two high school jazz bands across the globe to perform at the International Midwest Clinic in Chicago last December 2015. The jazz ensemble is led by HHS Director of Bands-Ronnie Rios. Rios also serves as the district’s Director of Music Programs. Great performance this morning! Proud of all our students, especially the 8 former Memorial Middle School students!